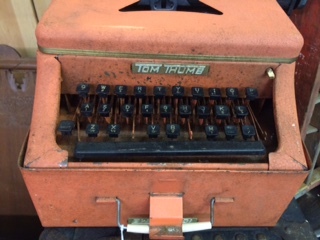 Vintage typewriter from the Shabby Shack Mall in Brevard, North Carolina, a short drive from Asheville and a stop off the Blue Ridge Parkway. Must creative types suffer for their art? While misery may not be a requirement, a recent sun-soaked stroll through Asheville’s River Arts District reminded me that sometimes a little pain can ignite a passion. Angela didn’t start painting until she was 30, she told me. A graphic artist at that time, she fell and broke her tail bone, an injury that required weeks of rest in order to heal. She turned to some craft paints to pass the time. Friends responded positively to her quirky pieces,and Voila! A new career was born. Eleven years later, the walls of her light-filled second floor studio on Roberts Street are blanketed with bright, whimsical paintings of mostly dogs, with a few cats and owls thrown in for good measure. She paints pets because they represent the purest forms of unconditional love, she explains on her web site. Her love of animals extends beyond the canvas; she is active with local animal rescue groups. 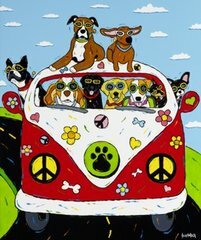 “Peace, Woof & Happiness,” by Angela Alexander. Her contemporary work is joyfully and creatively titled (Let It Bee; Yes, I’m Ignoring You). We chatted about the origins of titles; as a writer, I usually begin a piece with a working title; then after many rounds of revisions, another title jumps out at me from the depths of the story. Angela also may alter a title as a work progresses, and, just as writers seek critiques from readers’ or writers groups, she sometimes posts a work in progress on Facebook to solicit feedback from friends and fellow artists, she said. 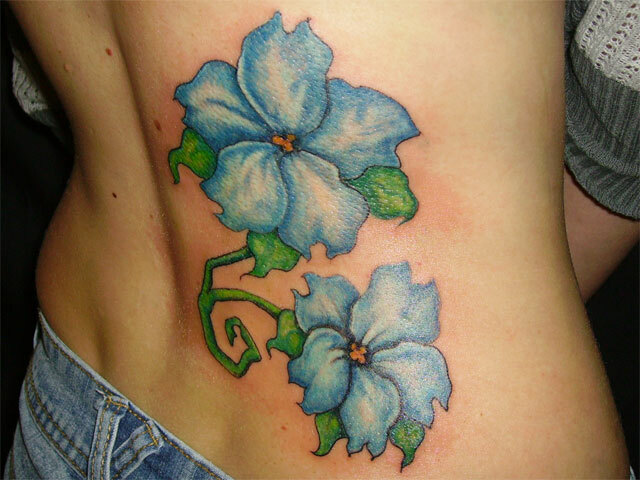 “Blue Flowers,” one of Kristin Foley’s custom tattoos. On a note outside her studio door, Kristin admits that having to deal with some serious health issues, including Type 1 (insulin dependent) diabetes, diabetic neuropathy and fibromyalgia can sometimes dampen her creativity. Despite this, Kristin went back to school to obtain her BFA in ceramics/printmaking and graphic design. Had I more time to wander the River Arts District, I might have discovered additional back stories inside each studio, tales of accidental vocations. 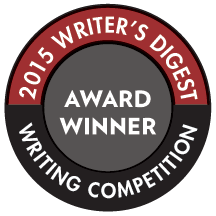 I myself didn’t start writing fiction until I was past 50, signing up for a New York City writing course on a lark. On that first train ride to the city, I couldn’t foresee that my voyage would unleash a wellspring of stories, let alone a full-length book. It just goes to show you: don’t be surprised what happens when you pick up a pen or a paintbrush. Or a tattoo needle.